Home » Website Building » WordPress » How to Install WordPress Manually? WordPress is famous for its 5 minutes installation process and the one-click installing services from hosting companies make the task much easier. But the problem with one-click installs like SimpleScripts or Fantastico is that you need to be careful when choosing username and database name from security perspective. Database name is generally created with additional prefixes and you will not be able to change the database name. If unnoticed your hosting account email will be assigned as your WordPress login username which you can’t change it anymore through front end admin interface. 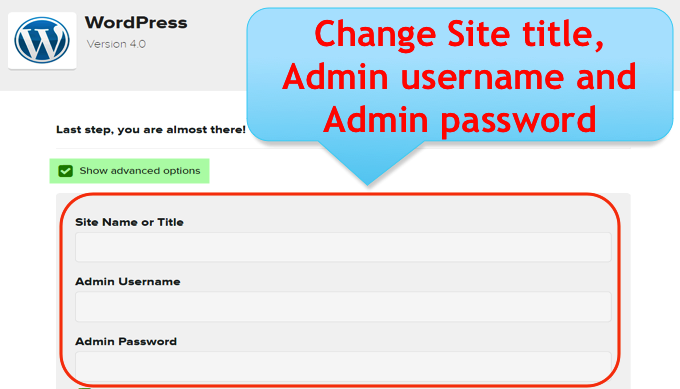 Learn more on how to change WordPress username. The solution here is to go for manual installation in which you can define your own parameters without any hassle. How to Install WordPress Manually on Your Domain? We will discuss each step in detail. Download the latest WordPress version here. 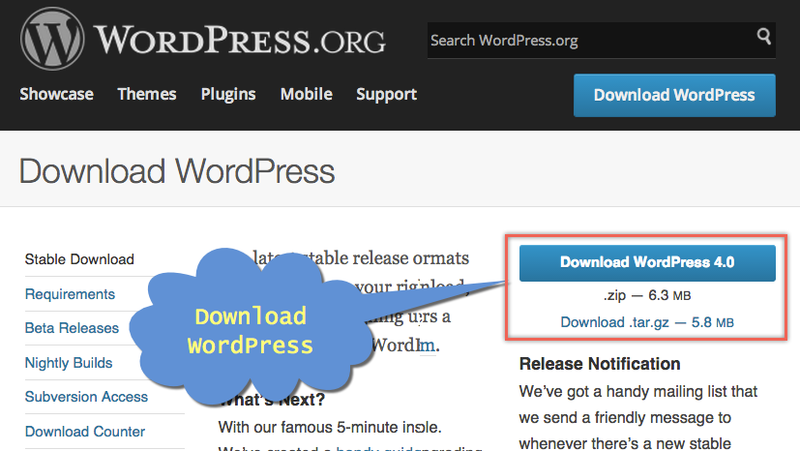 Extracting the downloaded zip file will result in a folder called “wordpress”. Use either FTP applications like FileZilla or “File Manager” option of cPanel hosting account in order to upload files to your domain. If you want to install WordPress on your domain or subdomain then copy all files from the downloaded “wordpress” folder and upload in your site’s root directory (/public_html). 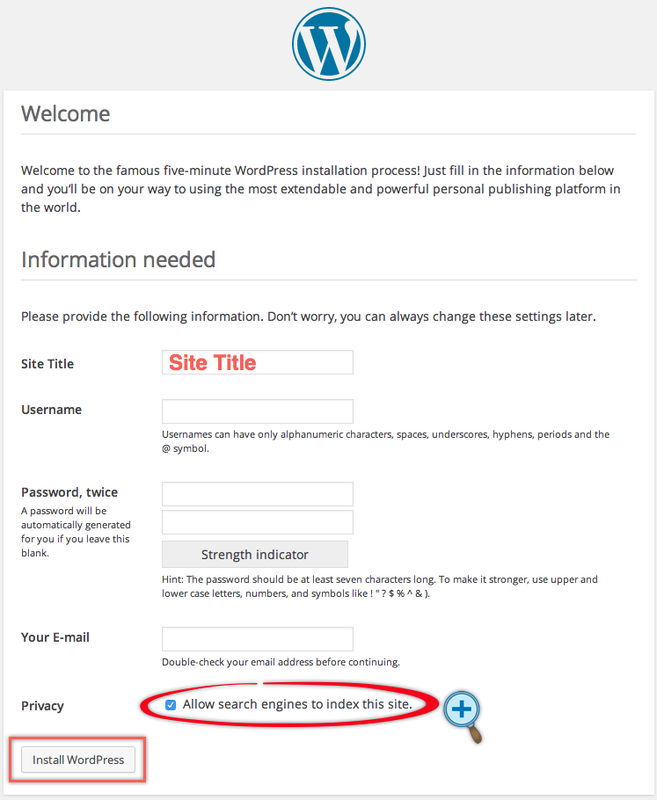 If you upload the entire “wordpress” folder then you will be installing WordPress on a subdirectory like “yoursitename.com/wordpress”. This is one of the mistake most of the beginner users make and checkout our article on WordPress beginners mistake to avoid such mistakes. During the time files are uploaded on your server, login to your hosting account and navigate to database section cPanel. 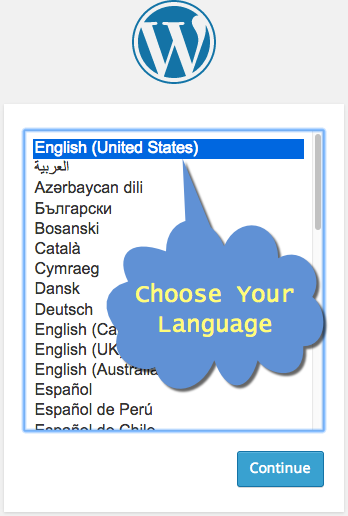 Click on “MySQL Databases” and create a new database. Below is the picture showing the database creation in Bluehost and learn more detail here on Bluehost database creation. Next create a user and assign the user to database in hosting account. Note down your database name, username and password details which you need to use in the next step. WordPress installation will have a file named “wp-config-sample.php” in your root folder and copy the content of this file. Create a new file called “wp-config.php”, paste the content inside this file and save. 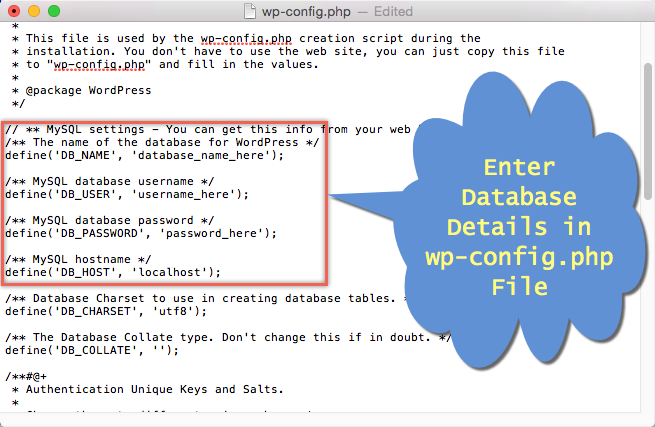 Now edit “wp-config.php” file and add the database details which you created in step 3. The hostname is always “localhost”, if it does not work then you can use your hosting server as a hostname. 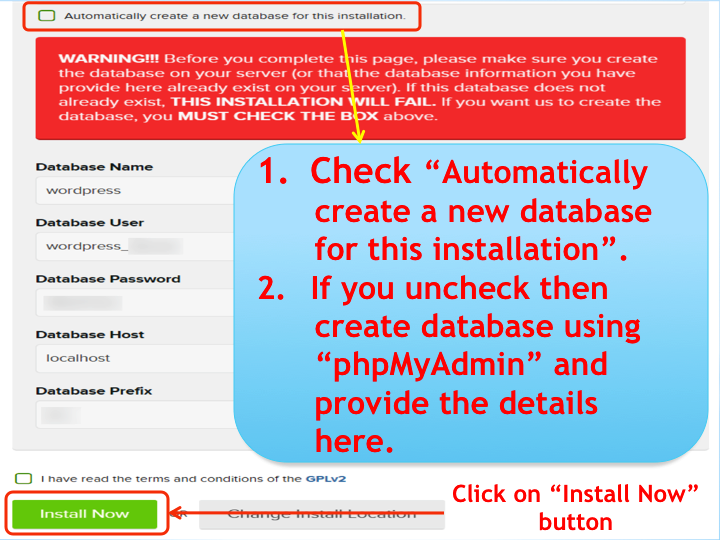 If you have difficulties in editing “wp-config.php” file then follow the below steps to connect your database. 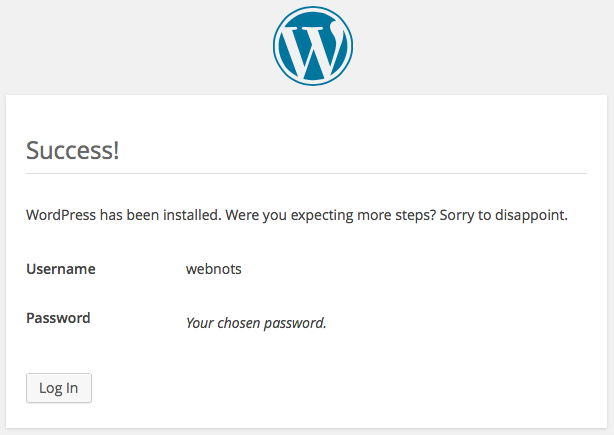 After you uploaded WordPress on your server and created a database, open your site’s URL in the browser. WordPress will prompt to you choose the language of your installation and choose the language from the list and click on “Continue” button. 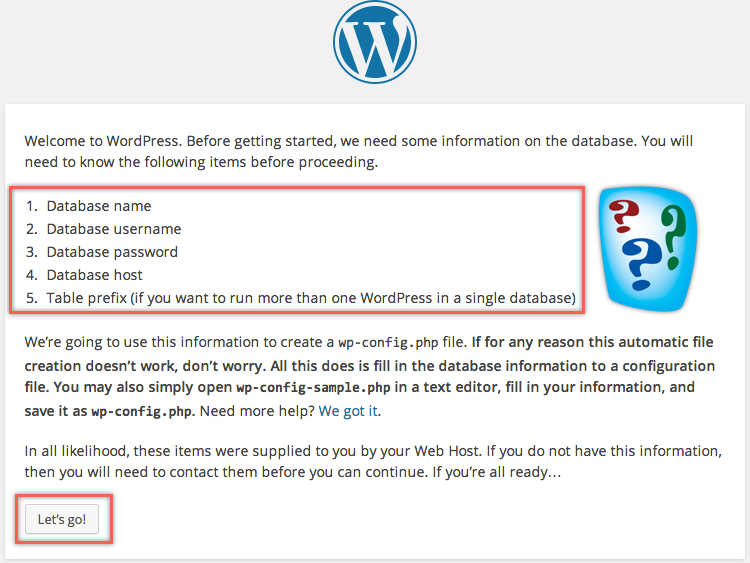 WordPress will indicate the missing “wp-config.php” file and provide an option to create it online. Click on “Create a Configuration File” to proceed further. 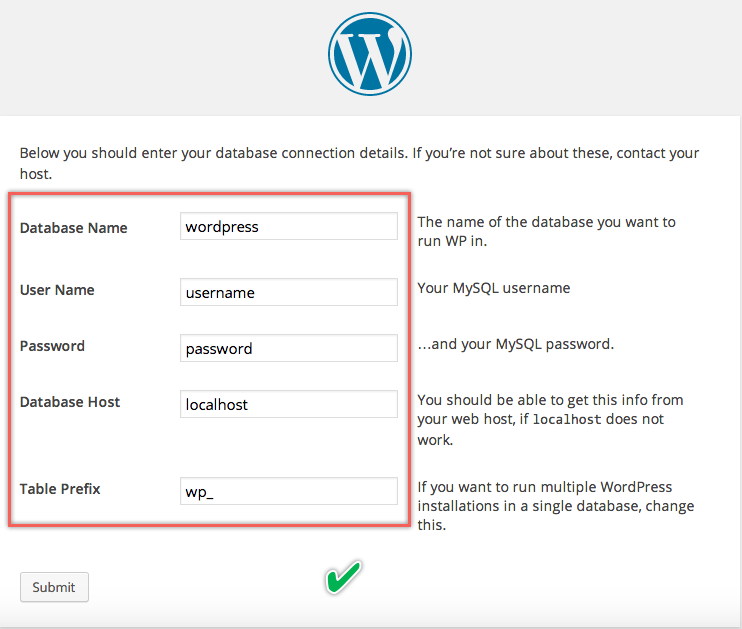 In the next screen WordPress will remind to keep database details ready and click on “Let’s go” button. Enter database name, username, password, host, table prefix and click on “Submit” button. Table prefix will be “wp_” by default and you can change to any prefix, as you need. If the database is not connected then you will see the below error, probably you might have entered wrong password. If your database is successfully connected then you will see the below screen and click on the “Run the Install” button. Enter title, email and login credentials for your WordPress site. We recommend to uncheck “Allow search engines to index this site” to avoid search engines displaying your site in the search results page. Once your content is ready then you can enable this option from frontend admin dashboard. Once installed you will see a success message as below. Click on login button to login to your WordPress admin dashboard and start building your site.